For the time being the system-description is only available in German language. Depending on the amount of Feedbacks I will translate into English as well. You have got accustomed to have the possibility to change your cup, shank or even rim on demand by using our modular mouthpiece system. 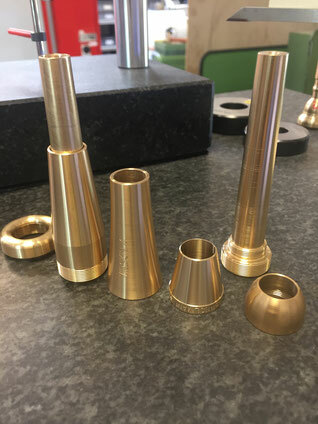 Since the very beginning of producing mouthpieces I experienced that even the design of the blank changes the behave of sound, tune and well-being. It is for you (not using our products) nearly impossible to compare regular light weight mouthpieces with mouthpieces having other design and mass as you won´t find two identically mouthpieces. We are very experienced in precise production, but sometimes small differences are evidently. Save your energy by using the appropriate design. Feel free to give me some feedback on your own experiences with shape and mass.